When it comes to buying a new product, most of us are the same: we want the best product for the lowest price. It’s only natural to look to save some money where we can. This leads to the age-old worry of ‘buy cheap, buy twice’, which is inconvenient at best, expensive at worst. The same goes for men’s wetsuits (and women’s wetsuits we suppose), especially if you’re new to surfing and you don’t want to buy an expensive suit for your first suit. It’s a safe assumption that you’re going to be looking for a wetsuit that isn’t expensive, but one that will last you a fair few years and many trips to the beach. Well, we’re hoping that we can help you out here. 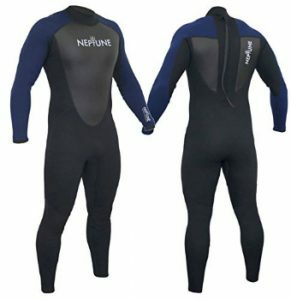 This post is all about men’s wetsuits, more specifically, good quality men’s wetsuits that you can buy online that are affordable and will do a good job for years to come. We’re going to recommend the best full length and shorty wetsuits for men, talking you through the benefits of having one or the other, and explaining the key wetsuit terms you’ll read when you go to buy a wetsuit online, so you know exactly what you’re buying. What are Wetsuits Made From? A full-length wetsuit is exactly that – a wetsuit that covers the full length of your arms and legs. You might sometimes see them referred to as full suits. There are several benefits to buying a full-length wetsuits. As they provide more coverage, they’ll keep your arms and legs warmer when you’re in the water. If it’s a sunny day, the longer sleeves will protect your arms and legs from any potential sunburn. Nobody likes sunburn. If you’re bodyboarding, the longer sleeves will also provide protection for your arms against any rubbing or chafing against the board. Here are our recommendations for the best full length wetsuits to buy online that tick the boxes of quality and value for money. 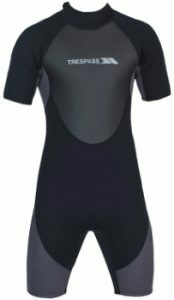 Osprey provide high-performance wetsuits for both men and women, and have a range of quality wetsuits for children too. They know what they’re doing when it comes to making wetsuits. What is a 3/2mm wetsuit? These numbers indicate how thick the wetsuit is. The first number, the 3 in this case, is the thickness of the neoprene (the material wetsuits are made from) on the body of the suit. The second number, 2mm, is the thickness of the sleeves. The benefit of a 3/2mm is that they offer warmth to the body and core, while a thinner sleeve gives you easier movement and more flexibility from the suit, making it easier to paddle, swimming and stand up on the board. The Osprey Origin men’s suit features flatlock seams for added comfort and less irritation. This is when the stitching of the suit is perfectly flat, rather than ridged, so won’t press down onto your skin. The 2nd of our 3/2mm suits is the Gul Neptune. Once again, Gul are renowned makers of good quality and durable wetsuits. The Neptune, like the Origin features flacklock seams, 3/2mm neoprene design and an easy open/closed zip and the back of the suit. On the chest and back of the suit is a smooth section to help prevent windchill. The smoother finish means there is a smaller surface area and less grip to catch the wind, keeping you warmer within the suit. Another great feature is the adjustable neck, allowing you to find a better fit and seal, to ensure cold water doesn’t flush into the suit. 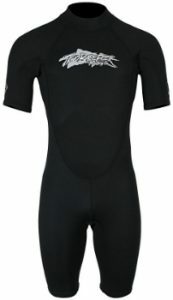 This 2.5mm wetsuit from Mountain Warehouse is an ideal wetsuit for summer surfing in warmer temperatures. The 2.5mm neoprene allows for easier movement within the suit, whilst still providing warmth throughout the entire wetsuit. A cool feature of the Mountain Warehouse full suit is the inner key pocket within the suit. If you don’t want to leave your house keys on the beach the secure inner pocket is an ideal solution. 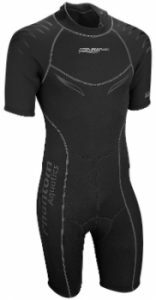 As well as reinforced knee pads for extra comfort and protection, the suit has an adjustable neck clothing. O’Neill are a leading name in surf wear. If you’ve ever shopped around for board shorts or skatewear, or if you went to high school in the 2000s, you’ve probably seen the O’Neill brand before. The Reactor II wetsuit from O’Neill is packed with features and finished with top-level build quality that you’d expect from a globally recognised brand. An upgrade of their old suit, the Reactor II is a new suit that features 3/2mm ultra-flex neoprene, flatlock seams and wind-resistant chest and back material. A key feature to the O’Neill Reactor II is the seamless ‘paddle zones’ (basically under the arms). This means there are no seams under your arms where you paddle – the part of the suit that goes under the most stress. This reduces the effect of heavy use, allowing the suit to last longer. 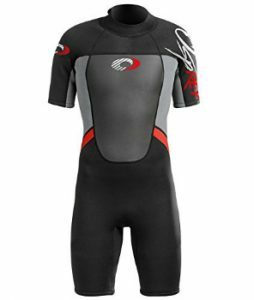 The Victory wetsuit from Two Bare Feet is a high quality, well rated 2.5mm wetsuit that offers comfort and warmth from a well-fitting wetsuit. Two Bare Feet have focused ensuring the Victory is comfortable to wear, but ensuring the suit fits well and doesn’t allow cold water to flush into the suit. The stretch-fit 2.5mm neoprene features flatlock seams and an adjustable collar with an easy-pull rear zip. Two Bare Feet have designed this suit to be the perfect beginner wetsuit for men. For the price and quality, the Victory wetsuit is definitely worth checking out. Moving onto short wetsuits, more commonly known as a shorty and sometimes referred to as spring suits. Shorties are wetsuits that have sleeves that stop at the knees and elbows. These are ideal for hotter weather, allowing you to stay cool (and even get a bit of tan). Not only are shorty suits good for getting your tan on, but they’re also very practical by being shorter. Not covering your knees and elbows means that you’re able to move with much less restriction, making it easier to swim, paddle and surf freely. Some of our recommendations will be shorter versions of the full suits we just showed you, so if there was one you liked the look of but you’re looking for a shorty, we could have the ideal option for you here. Trespass are a leading name in outdoor clothing and activity sportswear. Their men’s shorty is no different to their other products: good quality and well priced. Boasting top marks from buyers online, the ‘Scuba’ wetsuit is a great choice for surfing and plenty of other water sports. The Scuba is made from 3mm neoprene, so is a versatile suit that will provide comfort and warmth in temperatures from the teens upwards. With flatlock seams for added comfort and a mesh chest panel for extra heat retention, we’re sure you’ll get plenty of good use from the Trespass Scuba. The first of our shorty versions of the long length wetsuits is the Two Bare Feet Victory. We’re going to repeat ourselves here, as the features are largely the same, just in a shorter suit. The suit is constructed from 2.5mm neoprene and features flatlock seams and adjustable neck with back zip. Available with black, blue and red trim in sizes small to triple extra large. O’Neill have designed the Reactor II shorty to be the ultimate springsuit and the ideal option for beginners. In fact, O’Neill claim that this suit is “everything you could possibly want in an entry level wetsuit”. With 5/5 ratings from buyers, it would be hard to argue with them. The suit is constructed from 2mm neoprene on the core with a lot of emphasis being on manoeuvrability. The Phantom Aquatics Marine is a great allrounder if you’re looking for a versatile wetsuit to wear surfing and use again for other water sports. Featuring reinforced shoulders to add longevity and quality to the suit as well as 2.5mm neoprene to offer flexibility, plenty of movement and ample warmth when you’re in the water. The suit features a gripped seat and flatlock seams for adding comfort when sitting and moving around within the suit with a padded neck closure to stop water intake without causing discomfort on the neck. The Marine is also available with blue or red detailing. 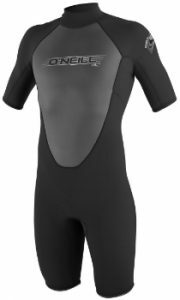 With specially designed mesh panelling on the chest and back to provide extra wind and element protection, the Osprey Origin is an ideal spring and summer wetsuit. As with the longer version, the Origin is a 3/2mm wetsuit that helps provide warmth for your chest and core, with more range of motion for your arms to assist with paddling. The seams are flatlock seams for less irritation and the collar is adjustable for more comfort and less intake of water. Available in a range of colours including: blue, green, black and red, black and yellow. Normally when you go to a surfing beach or a surf town you’ll see plenty of places hiring out wetsuits, so why bother buying if you can cheaply hire one for the day? There are plenty of reasons to buy a wetsuit, especially if you’re going to use the suit again in the future. If you’ve looked through our list of the best men’s wetsuits above, you might have noticed that they’re not at all expensive to buy. If you’re spending 4/5 days on a surfing trip and hiring a suit every day, it won’t be too long before you’ve spent the same amount on hiring a suit than you would have spent on buying one – so you might as well just buy one, and then you’ve got it to keep. The great thing about having your own wetsuit is that you can use it for a wide range of water sports and activities. If you ever fancy trying your hand at paddle boarding or waterskiing, you’ll have the wetsuit there ready to go, once again saving on hire costs. Another key benefit of owning your own wetsuit is that you won’t have to share one with anybody else. We know that sharing is caring, but you spend a lot of time in a wetsuit, working hard, sweating, and some people even go to the toilet in their wetsuit… no solids, don’t worry… but still, we’d recommend getting your own. For a few extra pounds, you can have your own wetsuit and make sure it’s not been used (or abused) by anybody else. Wetsuits are made from a material called Neoprene. Neoprene is a compound of different substances that result in the rubbery material of wetsuits. Neoprene is a highly thermally insulating material and water resistant. Your suit should keep you warm and prevent water passing through the wetsuit. A common misconception is that wetsuits are meant to keep you bone dry within the suit, but this isn’t true. In fact, a wetsuit works in the opposite way, by allowing water in. A wetsuit isn’t meant to keep you dry, but keep you warm. Neoprene is waterproof, so water won’t get through the suit but your suit will allow in a small amount of water through the ankles and wrists. This thin layer of water is trapped by the suit and then warmed up by your body heat, keeping you surrounded by a warm layer of water. If your suit is too big, the seals around your ankles and wrists will allow new, cold water into the suit, pushing the warm water out. This is known as flushing. Your wetsuit should retain heat and keep you warm in the water. Neoprene is available in a range of thicknesses. There are two key things to consider when selecting the thickness of your wetsuit. How warm (or cold) is it going to be when you’re surfing, and how heavy or flexible do you want the suit to be? Thicker suits will be warmer, but more restricting on your movements, whereas thinner suits don’t offer as much heat but are much more flexible and allow you to move your limbs with greater ease. The most common thicknesses of wetsuits are from 2mm-5mm. There are others, but for more specialised sports such as scuba diving. For surfing, 2-5mm are the most common thicknesses. The most popular thickness amongst surfers is 3mm as it provides plenty of warmth and is thin enough for you to move your arms and legs easily enough, allowing you to swim and paddle with more ease than a thicker suit. Once again, if you’ve checked out our recommendations above, you’ll have spotted a few 3/2mm wetsuits. A 3/2mm wetsuit combines thicknesses, better offering you warmth and flexibility. The first number, in the case 3 (other thicknesses are available such as 5/4mm) is the thickness of the body/torso and the second number, 2 here, is the thickness of the arms and sometimes the legs. A 3/2mm gives you plenty of warmth to the body with thinner limbs giving you more flexibility and better range of motion.